Why is it that so few bankers have been prosecuted and punished in the wake of the financial meltdown? Pundits are quick to point to inadequate funding for addressing financial crime or, more cynically, the revolving door between government regulatory agencies and Wall Street. But the ultimate answer may be at once more banal and more dispiriting, lying as it does at the very foundations of our criminal law. The conception of responsibility underpinning much of our criminal law contemplates the individual in isolation from others. As a result, our criminal law has tremendous difficulty tracking culpability in organizational contexts. That we are without the theoretical or justificatory resources to address organizational wrongs is not idle observation. This impoverishment accounts for many instances of failures to punish, and so many instances of justice undone – the rash of bankers evading punishment for the financial crisis being just one example. This Article uses the failure of criminal law to redress the wrongs of the financial crisis as a way to fix ideas in a larger theoretical quest, one that seeks to determine when and why one might deserve punishment for a group crime to which one did not culpably contribute. I aim to establish that, within organizational contexts, the grounds for praise and blame do not track individual causal contributions; accordingly, nor should the allocation of rewards and punishment. In place of causation or participation, I locate the executive’s blameworthiness in a novel theory of shared responsibility. And I argue that sometimes the quantum of blame he deserves on this theory licenses our prosecuting and punishing him for the corporate crime, independent of whether he is at fault. The idea that one person may be punished for the crime of another is unpopular but not unknown in the criminal law. But no existing doctrine of vicarious criminal liability would allow for the prosecution of an executive for a crime of his corporation, and none of these doctrines tracks the kind of responsibility I seek to elucidate here in any event. In this way, we lack both theory and doctrine to support the notion that executives might deserve prosecution and punishment for a crime of their corporation independent of whether they are at fault. This Article seeks to supply the missing theoretical account, and to identify the (relatively minor) doctrinal changes needed to operationalize the theory. 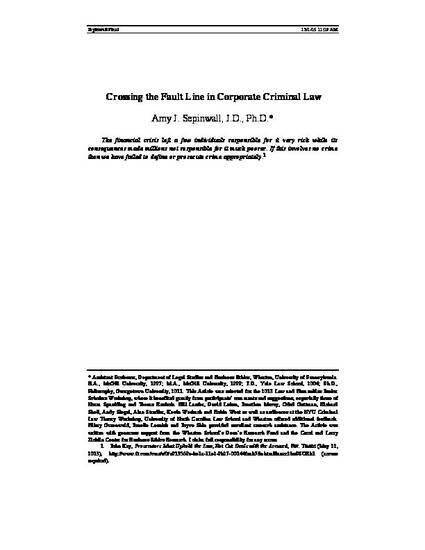 The Article thus aims not only to reform our thinking about criminal responsibility, but also to provide a concrete, practicable and just way of responding to corporate criminal wrongdoing.